Artificial intelligence, machine learning, and smart things promise an intelligent future. Today, a digital stethoscope has the ability to record and store heartbeat and respiratory sounds. Tomorrow, the stethoscope could function as an “intelligent thing” by collecting a massive amount of such data, relating the data to diagnostic and treatment information, and building an artificial intelligence (AI)-powered doctor assistance app to provide the physician with diagnostic support in real-time. AI and machine learning increasingly will be embedded into everyday things such as appliances, speakers and hospital equipment. This phenomenon is closely aligned with the emergence of conversational systems, the expansion of the IoT into a digital mesh and the trend toward digital twins. 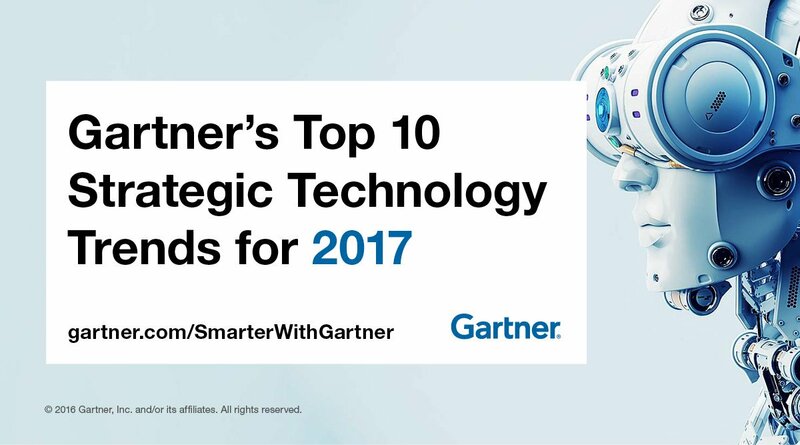 Three themes — intelligent, digital, and mesh — form the basis for the Top 10 strategic technology trends for 2017, announced by David Cearley, vice president and Gartner Fellow, at Gartner Symposium/ITxpo 2016 in Orlando, Florida. These technologies are just beginning to break out of an emerging state and stand to have substantial disruptive potential across industries. AI and machine learning have reached a critical tipping point and will increasingly augment and extend virtually every technology enabled service, thing or application. Creating intelligent systems that learn, adapt and potentially act autonomously rather than simply execute predefined instructions is primary battleground for technology vendors through at least 2020. AI and machine learning (ML), which include technologies such as deep learning, neural networks and natural-language processing, can also encompass more advanced systems that understand, learn, predict, adapt and potentially operate autonomously. Systems can learn and change future behavior, leading to the creation of more intelligent devices and programs. The combination of extensive parallel processing power, advanced algorithms and massive data sets to feed the algorithms has unleashed this new era. In banking, you could use AI and machine-learning techniques to model current real-time transactions, as well as predictive models of transactions based on their likelihood of being fraudulent. Organizations seeking to drive digital innovation with this trend should evaluate a number of business scenarios in which AI and machine learning could drive clear and specific business value and consider experimenting with one or two high-impact scenarios.. Intelligent apps, which include technologies like virtual personal assistants (VPAs), have the potential to transform the workplace by making everyday tasks easier (prioritizing emails) and its users more effective (highlighting important content and interactions). However, intelligent apps are not limited to new digital assistants – every existing software category from security tooling to enterprise applications such as marketing or ERP will be infused with AI enabled capabilities. Using AI, technology providers will focus on three areas — advanced analytics, AI-powered and increasingly autonomous business processes and AI-powered immersive, conversational and continuous interfaces. 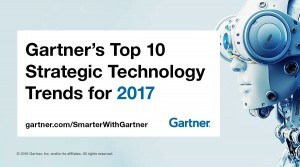 By 2018, Gartner expects most of the world’s largest 200 companies to exploit intelligent apps and utilize the full toolkit of big data and analytics tools to refine their offers and improve customer experience. New intelligent things generally fall into three categories: robots, drones and autonomous vehicles. Each of these areas will evolve to impact a larger segment of the market and support a new phase of digital business but these represent only one facet of intelligent things. Existing things including IoT devices will become intelligent things delivering the power of AI enabled systems everywhere including the home, office, factory floor, and medical facility. As intelligent things evolve and become more popular, they will shift from a stand-alone to a collaborative model in which intelligent things communicate with one another and act in concert to accomplish tasks. However, nontechnical issues such as liability and privacy, along with the complexity of creating highly specialized assistants, will slow embedded intelligence in some scenarios. The lines between the digital and physical world continue to blur creating new opportunities for digital businesses. Look for the digital world to be an increasingly detailed reflection of the physical world and the digital world to appear as part of the physical world creating fertile ground for new business models and digitally enabled ecosystems. Virtual reality (VR) and augmented reality (AR) transform the way individuals interact with each other and with software systems creating an immersive environment. For example, VR can be used for training scenarios and remote experiences. AR, which enables a blending of the real and virtual worlds, means businesses can overlay graphics onto real-world objects, such as hidden wires on the image of a wall. Immersive experiences with AR and VR are reaching tipping points in terms of price and capability but will not replace other interface models. Over time AR and VR expand beyond visual immersion to include all human senses. Enterprises should look for targeted applications of VR and AR through 2020. Within three to five years, billions of things will be represented by digital twins, a dynamic software model of a physical thing or system. Using physics data on how the components of a thing operate and respond to the environment as well as data provided by sensors in the physical world, a digital twin can be used to analyze and simulate real world conditions, responds to changes, improve operations and add value. Digital twins function as proxies for the combination of skilled individuals (e.g., technicians) and traditional monitoring devices and controls (e.g., pressure gauges). Their proliferation will require a cultural change, as those who understand the maintenance of real-world things collaborate with data scientists and IT professionals. Digital twins of physical assets combined with digital representations of facilities and environments as well as people, businesses and processes will enable an increasingly detailed digital representation of the real world for simulation, analysis and control. Blockchain is a type of distributed ledger in which value exchange transactions (in bitcoin or other token) are sequentially grouped into blocks. Blockchain and distributed-ledger concepts are gaining traction because they hold the promise of transforming industry operating models in industries such as music distribution, identify verification and title registry. They promise a model to add trust to untrusted environments and reduce business friction by providing transparent access to the information in the chain. While there is a great deal of interest the majority of blockchain initiatives are in alpha or beta phases and significant technology challenges exist. The mesh refers to the dynamic connection of people, processes, things and services supporting intelligent digital ecosystems. As the mesh evolves, the user experience fundamentally changes and the supporting technology and security architectures and platforms must change as well. Conversational systems can range from simple informal, bidirectional text or voice conversations such as an answer to “What time is it?” to more complex interactions such as collecting oral testimony from crime witnesses to generate a sketch of a suspect. Conversational systems shift from a model where people adapt to computers to one where the computer “hears” and adapts to a person’s desired outcome. Conversational systems do not use text/voice as the exclusive interface but enable people and machines to use multiple modalities (e.g., sight, sound, tactile, etc.) to communicate across the digital device mesh (e.g., sensors, appliances, IoT systems). The intelligent digital mesh will require changes to the architecture, technology and tools used to develop solutions. The mesh app and service architecture (MASA) is a multichannel solution architecture that leverages cloud and serverless computing, containers and microservices as well as APIs and events to deliver modular, flexible and dynamic solutions. Solutions ultimately support multiple users in multiple roles using multiple devices and communicating over multiple networks. However, MASA is a long term architectural shift that requires significant changes to development tooling and best practices. Digital technology platforms are the building blocks for a digital business and are necessary to break into digital. Every organization will have some mix of five digital technology platforms: Information systems, customer experience, analytics and intelligence, the Internet of Things and business ecosystems. In particular new platforms and services for IoT, AI and conversational systems will be a key focus through 2020. Companies should identify how industry platforms will evolve and plan ways to evolve their platforms to meet the challenges of digital business. The evolution of the intelligent digital mesh and digital technology platforms and application architectures means that security has to become fluid and adaptive. Security in the IoT environment is particularly challenging. Security teams need to work with application, solution and enterprise architects to consider security early in the design of applications or IoT solutions. Multilayered security and use of user and entity behavior analytics will become a requirement for virtually every enterprise. David Cearley is vice president and Gartner Fellow in Gartner Research and is a leading authority on information technology. Mr. Cearley analyzes emerging and strategic business and technology trends and explores how these trends shape the way individuals and companies derive value from technology. My Howard Jackson Consultant’s approach to recruitment is unrivalled by any other consultant I have come across.